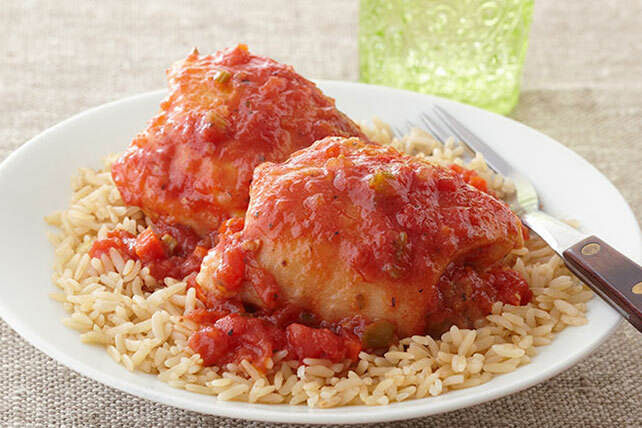 Experience the delicious flavor of this Slow-Cooker Chicken 'Osso Buco'. This Slow-Cooker Chicken 'Osso Buco' will be a new family favorite. Toss chicken with flour; place in slow cooker sprayed with cooking spray. Add all remaining ingredients except rice; stir. Cover with lid. Cook on LOW 6 to 8 hours (or on HIGH 3 to 4 hours). Stir chicken mixture until sauce is thickened. Serve over rice. Combine ingredients as directed in Dutch oven or large deep skillet instead of the slow cooker. Bring to boil on medium-high heat; cover. Simmer on low heat 4 to 5 hours or until chicken is done (165ºF), stirring occasionally. Serve over rice. Substitute hot cooked noodles or white rice for the brown rice.